Experience a kayak that has excellent stability, a smooth ride, and all day performance with the Hobie Mirage Revolution 13. The Revolution 13 is built for speed and efficiency. With great storage, cup holders, and secure rigging on the top, you'll have plenty of space to manage your gear, clothing, or snacks! And the new Vantage CT seat gives you a world of comfort and easily adjustable seating positions for the perfect feel. With the included Mirage Drive, you'll be able to move easily when tired from kayaking, or glide through the water with ease. This is a very fast kayak! We have one on our boat and it is great to take out in the calm mornings. I've gone up to 6 mph with this and even a little more using the sail. It's pretty stable too. Would not recommend it if you are over 240 lbs however. My son (6'5 260 lbs) tried to use it and he capsized after launching it! I have mine with the sail kit and pontoons. Would highly recommend the sail kit, reminds me of my keelboat days. Outstanding performance and stability. The drive is very efficient and with the turbo fins, this thing is fast. It's a longer Hobie kayak at 13 ft, but even with the small rudder, the maneuverability is great. 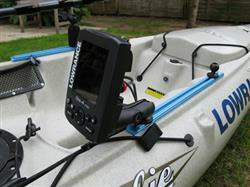 The kayak moves smoothly and is quiet on the water. Hobie really builds a great product. Great shipping by SKC; the kayak arrived in Havasu with no problems what so ever. Definitely thinking about buying another one for my son.